NEW YORK (CNNMoney) -- Harry Potter series author J.K. Rowling will, for the first time, release the famous children's stories in e-book form in October through a new website called Pottermore. Rowling's site will be the exclusive sales channel for the Potter e-books, bypassing traditional e-book stores like Amazon's (AMZN, Fortune 500) Kindle store, Barnes and Noble's (BKS, Fortune 500) Nook store and Apple's (AAPL, Fortune 500) iBookstore. The Harry Potter series will be published in the open-source e-Pub format, which is compatible with any electronic reading device, including the iPad. Though Rowling is going direct to consumers with Pottermore, certain rights holders will still have a payday. British publisher Bloomsbury, which maintains the books' printing rights in the U.K., said it will participate in the sale of e-books from Pottermore and will receive a share of the revenues. Scholastic (SCHL) is the U.S. rights holder for the Potter series. The company said it too will receive a royalty on sales of the U.S. editions of the e-books. 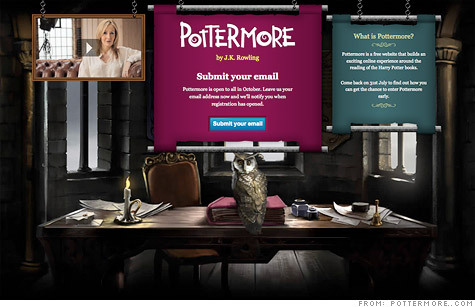 Scholastic described its role as a "key partner in the Pottermore project, including connecting teachers and parents from our school and online channels directly to e-book sales via Pottermore and providing marketing and promotion support." Rowling has resisted releasing the seven Harry Potter books in digital format since the first volume was published in 1997. But she said the time has come to give new formats a try. "I wanted to give something back to the fans that have followed Harry so devotedly over the years, and to bring the stories to a new digital generation," the British author said in an announcement Thursday morning on YouTube. "I hope fans and those new to Harry will have as much fun helping to shape Pottermore as I have." As an extra incentive to buy the books in the digital format, Rowling will treat Potter fans to 18,000 new words throughout the series. All seven books will be released on pottermore.com in October, and users can begin to register to access the test version of the site on July 31 -- Harry Potter's birthday. The site quickly got overwhelmed by the response. "We know a lot of people are unable to submit their email address right now," the site's Twitter account said Thursday morning. "Please be patient with us and try again in a few minutes." Fans aren't the only ones missing Rowling's boy wizard. "When I finished writing the last Harry book, well I haven't cried that much since my mother died," Rowling said Thursday at a press conference in London. "I never cry over a man, but this was more like an ex-boyfriend." But don't expect any sequels. "I'm pretty sure I'm done on the novel front," Rowling said. "This will never again happen in my life, so this was my way of staying with the material."